The core idea here was invented and published by Thomas McCabe, author of the widely used software complexity metric. This new mathematical breakthrough proves that any declarative statement we make has six corollaries that hold the same presence and energy as the original statement. The underlying mathematics unfolds these six corollaries -- when examined this larger truth captures the full impact of our statements – – much of which is typically unseen. The impact is to comprehend and realize the sixfold reality of the things most critical to us – – our corporate mission statements, strategic directions, highest priority tasks, biggest challenges, corporate culture .. Equally important on a personal level this is a great way to unfreeze our emotional and intellectual blocks, it's a direct way to shed light on our blind spots. Many people have used this technology to change the things not working in their lives. A specialized software module has been developed to assist us with our personal habits – – both breaking bad habits and acquiring good habits. The point of this paper is that our very thoughts like Plato's solids have a geometric shape. The thoughts we formulate have a symmetric mathematical structure; our ethereal and fleeting thoughts like nature have a beautiful mathematical foundation. 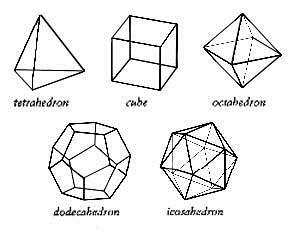 Like Plato's solids of antiquity the structure of mankind’s thoughts also has a classic geometric shape. What's more this geometric structure of our thoughts holds many derivative thoughts that have a presence that only gradually seeps out and unconsciously unfolds. This is the psychological epistemological blowback always present within hidden dimensions of our thoughts. The following discussion will unfold the geometrical structure of our thoughts through the increasing complexity of compound thoughts and multidimensional geometrical objects. It also turns out that the group of symmetries of these geometrical objects reflects the derivative corollaries that are induced by our thoughts --- derivative thoughts that have the same presence and energy as our initial thoughts. On August 2, 2012 Tom McCabe gave a lecture at the Defense Acquisition University located in Fort Belfour, Virginia. At the beginning I found it important to frame the lecture. For those who thought the subject of ‘consciousness’ too unearthly I explained that the techniques can be used for decision-making – – any proposition that should be carefully considered could indeed be looked at in six distinct ways. What's more, I explained that looking at different facets of a proposition opens up insights that are very useful. This let me bridge into DAU’s world of software development and DOD policy. We worked with the statement "Software apps present a cyber security risk". The result was a radically different way to view apps and a new perspective of apps vis-a-vis risk and new found opportunity. We take on the biggest challenge your organization faces and permute it into six fresh new viewpoints. We work with your key executives, the session lasts four hours. One hour Expanded Consciousness executive overview, one hour framing your biggest issue. One hour looking at the driving challenge in six new ways. One hour turning a conceptual breakthrough into a strategic plan. The result is a break through strategic plan. We follow up at weekly intervals. The attendees will get the new Expanded Consciousness book and your company will have use of the EC automated tool so as to reapply the technology and ingrain it into your culture.